Yesterday, SpaceX delivered a government satellite to orbit using its Falcon 9 rocket. Typically, these rockets return to Earth to live another day, but on this occasion, the company wanted to test an experimental landing system. The Falcon 9 was meant to end this mission in a watery grave, but the rocket unexpectedly managed to survive its deliberate landing in the ocean. The Falcon 9 rocket successfully ferried the GovSat-1 communications satellite toward orbit 32 minutes after launch from Cape Canaveral Air Force Station in Florida. Commissioned by the Luxembourg government and satellite operator SES, the new satellite “enables secure communication links between theaters of tactical operations, for maritime missions or over areas affected by humanitarian crises,” according to a SpaceX press package. The satellite is designed for intelligence surveillance and reconnaissance jobs, and is equipped with anti-jamming features and encrypted telemetry and control. It was only later that SpaceX CEO Elon Musk explained what was going on, and that the rocket was being used to test a new landing system. 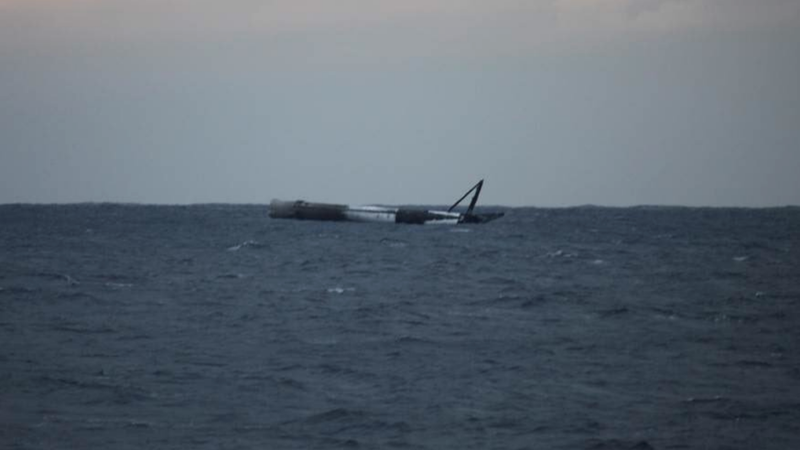 The Falcon 9 “landed” on the water to prevent any damage to the floating landing pad. [By] using three engines, it is entirely possible that SpaceX hopes to eventually move towards even more aggressive landing burns. While the obvious downsides likely include difficulty maintaining control and increased stresses on the booster, the benefits are also pretty inherent. By using more engines, the length of the landing burn could be drastically shortened, resulting in far more efficient propellant usage by minimizing losses to gravity (every second the rocket is trying to go upwards is a second fighting against Earth’s gravity, which pulls the rocket down at ~9.8 meters/second squared). Crazily, the rocket appeared to survive the “landing,” and SpaceX will tow it back to shore for inspections. SpaceX had said it wasn’t going to recover this rocket, so it’s not known if it’ll be patched-up and used for a third time. It’s doubtful, however, that a client would want to place a precious multi-million dollar satellite atop a rocket that’s been drenched in salt water. But who knows. The company might be able to salvage some parts at the very least.